National Pet ID Week is focused on spreading awareness of the importance of pet identification. Pets go missing every day, but wearing some form of identification can greatly increase a pet’s chances of making it back home. And it’s especially important when you’re traveling or away from home because your pet can’t use familiar scents and sights to find his way back home. A microchip is a good first step to making sure your pet can be identified because once chipped, your pet is chipped for life. However, it takes a special tool (that most vets and shelters have) to scan a microchip, which is why visible identification is just as important. You’re not limited to a hanging metal tag; in fact you’ve got many choices! Here are several different ID options to consider for your dog or cat. Of course we’re all aware of the classic hanging metal dog tag. These days, there are countless options, shapes, sizes, and colors galore to get the perfect tag suited for your dog’s personality. 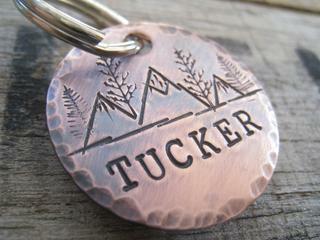 If you’re looking for something unique, consider shopping on Etsy for a handmade dog tag. 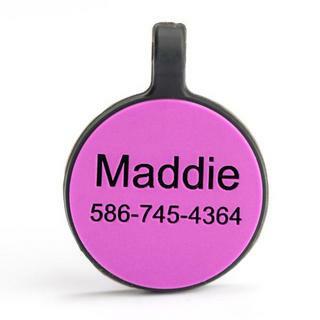 If jingling tags are the reason your pet rarely wears his collar, then check out these silicone pet tags. They are lightweight, durable, and completely silent. However if you have a dog that likes to wrestle, it is possible for the silicone to wear down over time and eventually break at the loop (speaking from personal experience). A collar embroidered with your phone number and your pet’s name is another “silent” alternate to the traditional hanging ID tag. With big, bold letters, it’s easy to read from a distance, which makes this a good option for skittish dogs. Here’s another great silent option for pet identification. The slide-on plate is made of metal which means it will last a long time, but it doesn’t dangle or jingle. Win-win! 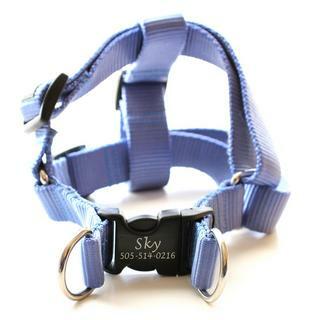 Plus you can easily transfer it to other collars without having to fuss with a metal key ring. 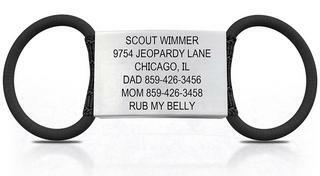 For harnesses or collars with buckles, try the open style slide-on ID tag. 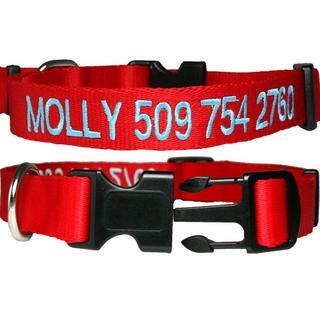 If collars aren’t really your pet’s thing, you might consider getting your pet’s harness embroidered with his contact information. Some pets are masters of escaping from their collars, so a personalized harness is the perfect solution to ensure your pet can always be identified. Microchip: check. ID tags: check. For additional peace of mind, you may also want to get a GPS tracking device for your pet.